I’ve been thinking a lot about my stash lately and wondering what I’m going to do with some of the fibre I have accumulated over time. My enthusiasm and excitement lays with natural shades and local fibre but I’ve been feeling the pull of some smaller, brighter spinning projects. As well, I have two projects on the go that have used 3 skeins of handspun. 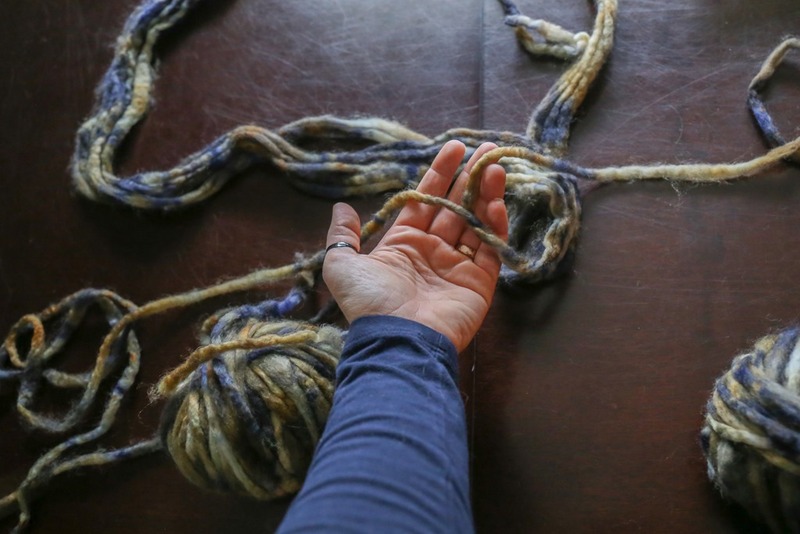 Naturally, now I’m all, “Oh no, I have no stash of handspun left!” Because obviously, knitting with three skeins has made a huge dent in my handspun stash. Obviously. 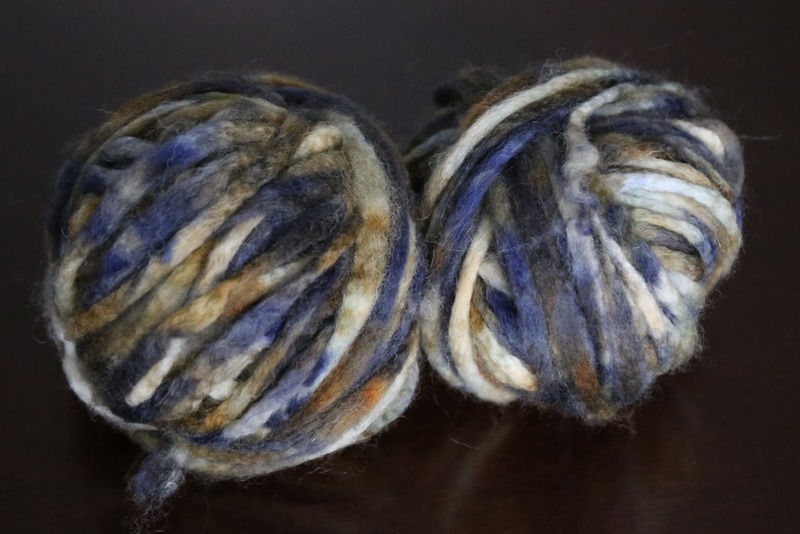 Earlier last week, I decided to pull out some pin-drafted roving that has been languishing for a while. This particular colourway and fibre is part of my Spin the Bin submission for 2016 so I had it in the back of my mind to work on sooner, rather than later. I’m completely in love with these neutral browns, gentle yellows and navy. They are my favourite colours, both combined and on their own. 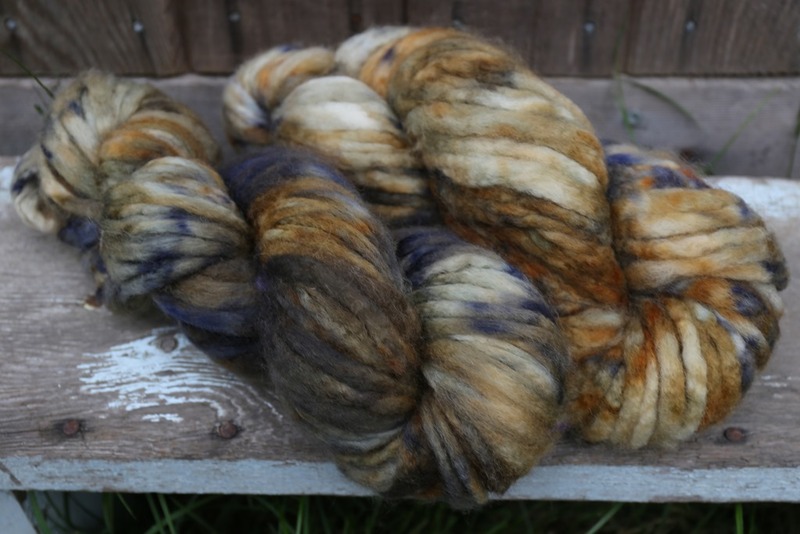 I bought this fibre at Fibres West in 2014, which is getting to be a while for me to have something in my stash. After chatting with Maryanne about pencil roving at Knit City 2015, I decided to try her recommendation and stripe the fibre in half prior to spinning. This resulted in two 50 gram balls of fibre to spin. I’ve been breaking off roughly a yard or so at a time and pre-drafting, spinning from that. Thus far, it is creating a lovely low-twist, soft spun yarn. I recently bought another Natural Knot Wood Capar spindle from a local spindle dealer (that sounds completely elicit). 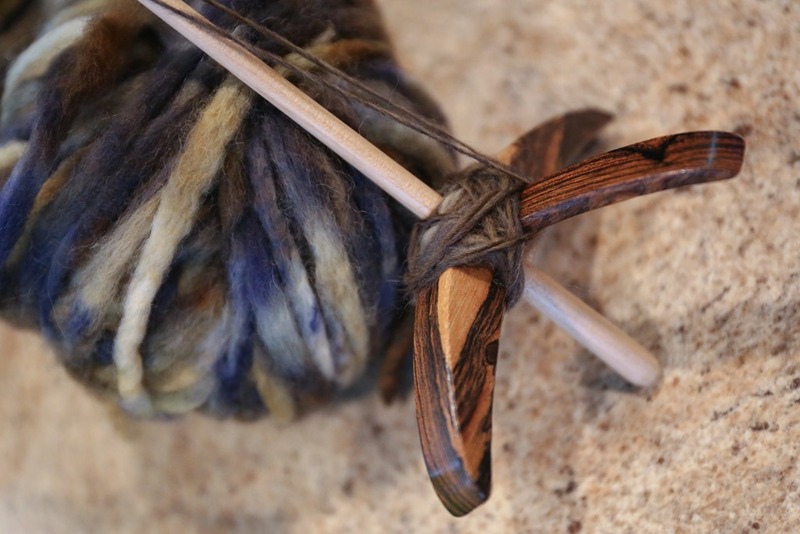 This is a Boscote wood with a Maple shaft and weighs 30 grams ( this one is considered size large if you are looking at Etsy for more information). 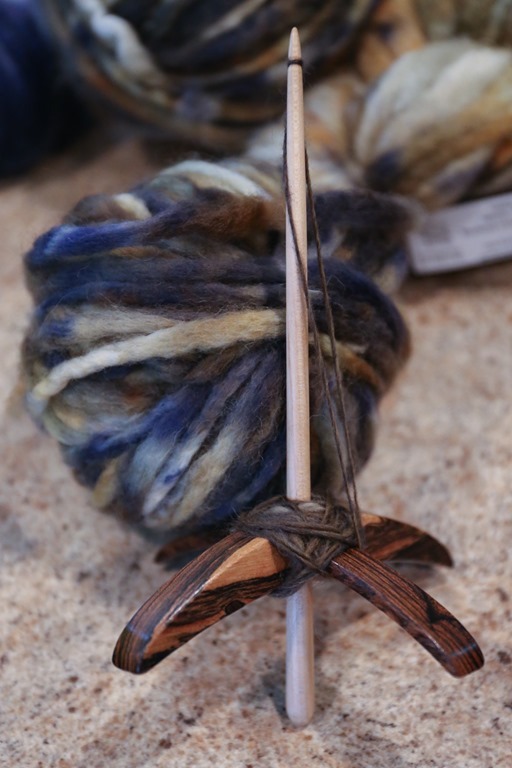 Absolutely beautiful – I am so happy about this spindle – it is my first large size Capar. It spins slightly differently from my TurtleMade spindles because it is ever so much lighter but it has a lovely spin. I have 200 grams of this fibre. My plan is to work on this slowly over the next couple of months, between my other spinning projects. It is a lovely stress-buster in the slowness and meditative quality that these larger spindles offer. I just love them. For some fun, I decided to take a quick video of my work tonight on my spindle – I hope you enjoy this quick video. It’s not very professional but it give you an idea! Cool video! You make it look so easy :) And I love the color of that yarn! Haha thanks! I’ve been doing it for a while 😉 actually the yarn is really surprising me – I’m loving these colours too! Fun to watch you do that. Are you going to leave the yarn as singles? It looks beautifully even and the colours are so you! I recently had a project jump the queue just because I needed something quick in bright colours. Cause my Tour de Fleece plans are also undyed. As much as I love my neutrals some variety is needed. Great video, Rachel! Thank you for sharing. What a neat demo! The yarn looks like it will turn out to be awesome. Any thoughts on what to make with it? I’m thinking a shawl! Thank you!